Vianney Boncorps donated to the Carry On Campaign to make me review one of his favorite films, trusting that I'd do right by it. And now I owe him thanks for introducing me to one of the finest costume dramas from its decade. The life of 17th Century soldier-poet Hector-Savinien de Cyrano de Bergerac was one of incident and drama; but the real man has been largely lost to time, thanks to a tremendous popular 1897 play by Edmond Rostand, titled Cyrano de Bergerac and pilfering a healthy number of details from the true history of the man with a great many exciting, romantic embellishments. It has remained near the public consciousness ever since, largely on the basis of its famous scene in which the witty, eloquent Cyrano feeds lines to his friend Christian de Neuvillette to woo Cyrano's cousin Roxane, despite being in love with Roxane himself. That, and because Cyrano has a big ol' nose. Every likes to watch folks with big damn noses. Cyrano de Bergerac was filmed a hell of a lot of times in its first century of life and parodied just as often, perhaps most prominently in a 1950 English-language version that won José Ferrer an Oscar (tragically and incomprehensibly, Jimmy Durante was never called upon to play the part). But by all accounts, the best version is the 1990 adaptation written by Jean-Claude Carrière and director Jean-Paul Rappeneau, a moderately well-regarded filmmaker with a career of almost Malickian inconstancy; it was one of the most expensive and lavish French film productions in history, making an international splash, and turning the talented 42-year-old actor Gérard Depardieu, in the blink of an eye, into the most famous French movie star in the world. It is one of the most widely-seen and best-loved French movies of its generation. And damn me, but it manages to deserve every ounce of hype. The first thing one notices about the film, before one word is spoken, is how intently - a curmudgeon might say, anally - detailed the filmmakers' re-creation of 17th Century Paris looks, easily one of the most fully-realised costume drama sets of that or any other era. The three people responsible for this totally immersive mise en scène - production designer Ezio Frigerio, set decorator Jacques Rouxel, and costumier Franca Squarciapino - may not be household names even by the standards of below-the-line film craftspeople (Frigerio and Squarciapino worked mostly in opera, often with each other), but what they put together would make any superstar film designer blush with envy. The Paris of Cyrano de Bergerac is palpable, living, meticulously observed. It is transportive - there is an uncanny sense one gets that the film itself is from the 1640s, ingeniously preserved throughout the centuries so that it merely appears to habe been filmed in the 1980s. Rappeneau , of course, contributes in no small way to this impression: his dextrous management of the background extras is invisible in the grand scheme, but so precise and well-aimed that it can't help but make a subliminal impression on the viewer; thus this exceedingly convincing simulacrum of Paris is peopled with exceedingly convincing Parisians. Meanwhile, the handling of the film's visuals (it was shot by Pierre Lhomme, who was at times in the Merchant-Ivory sphere of influence; but despite their lushness, none of those films have a patch on Cyrano's realism) strikes a balance between the documentary - simply recording the sets in the most detail possible - and the poetic, in a number of shots that are beautiful for the sake of it, as well as a scheme of camera movement that can only rightly be called "presentational": stressing the relationship between the actors and the sets to such a degree that it becomes almost stagey, yet in a way that could never, ever be replicated on any stage. How I do wish that my French was better, that I might have fully appreciated the depth and nuance of that rhyming language! As it was, I was merely aware of the playfully artificial lilt of the dialogue, relying mostly on the subtitles - and they are truly amazing, not terribly accurate but hugely evocative of the feel of the original, one of the most perfectly excellent translations into English that I've had the privilege to read. Even granting all of this, the performances get the point across in any language; Depardieu's especially, a staggering turn that combines emotional resonance with a delightfully arch theatricality, and finds a weirdly naturalistic way of reciting the heavily unnatural words. But not only he: all of the main actors acquit themselves beautifully, particularly Anne Brochet as Roxane, a deliberately stiff and marginally confused performance that plays up the character's callowness, and Jacques Weber as the Comte de Guiche, one of many rivals for Roxane's affections, who manages the incredible feat of playing a pompous aristocrat douche, entitled and smug, who nevertheless remains entirely likable, and even pitable. 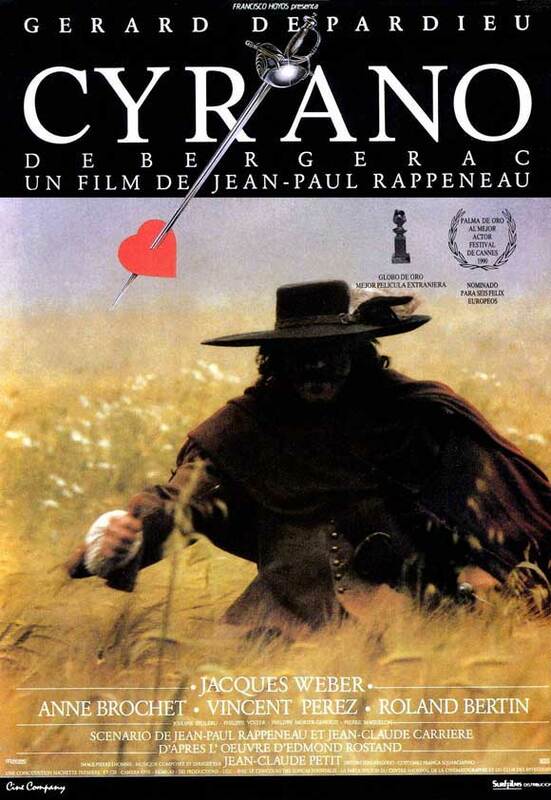 Every character is pretty likable, really, for Rappeneau plays up the most humane, earthy parts of the story, not necessarily an earth-shattering bold choice, although it's perhaps surprising how sly and funny this Cyrano de Bergerac is. Not hardly a farce, nor even exactly a comedy; but a production entirely aware of the silly edges of the play, and happy to play that up. Like the contrast between the realistic mise en scène and the inflated language, this unexpected stress on the humorous possibilities of the text leaves the film with a bit more freshness, even cockiness than one usually expects from a prestigious costume drama. And prestigious it most certainly is: the film won a nice cache of awards from Cannes on down, several for Depardieu's revelatory performance; it even accomplished the rare feat of taking down no less than five Oscar nominations (including a win for Squarciapino's costumes), in a film with zero words of English. It came at the exact right time: the mid-'80s to the late-'90s witnessed a huge explosion in the popularity of such period literary adaptations, and this doubtlessly helped the film attain such exposure. But it leaves the great bulk of those fellow travelers in the dust, with more artistry and energy than virtually any American costume drama from that period you could name. The French, they do know the right way to do cinema.